FootWise Podiatry Centre is a family-run practice where patients are cared for in a personal and friendly fashion. 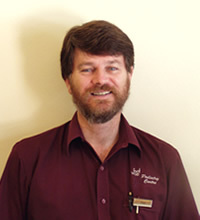 John Burrie, the podiatrist, is known for his thoroughness and true helpfulness in his treatment of his patients. FootWise Podiatry is an entirely Mobile Podiatry Service. Therefore your location is our location. We come to you, saving you travelling time. Tell us when you can be seen at your home, and we'll work around your time needs. Call us to book a time that suits you. We offer a Home Visit service. We know that some patients may be bed-ridden or may not be in a physical condition to come to the practice in order to be treated. Our Home Visit service allows them to be treated in the comfort of their own home. The Nursing Homes of Cairns can now have their residents treated, thanks to the special contract service we offer, at FootWise Podiatry Centre. At FootWise Podiatry Centre, each one of our patients is cared for personally. Here, people are still people, not numbers. You are a unique patient, and are treated personally and thoroughly to truly relieve you of your foot problem. If you need orthotics, we offer a second-to-none guarantee on our custom-made orthotics. Read more here. Because we are a purely mobile service, we save you travelling time, and work around your timetable. With our podiatrist's friendly and thorough approach to solving your foot problems, our patients leave happy and comfortable again every time. With FootWise Podiatry Centre, we'll get you back on your feet again! Our prices are the most affordable in Cairns, which makes podiatric care within everyone's reach. Ask how much we charge for custom-orthotics and general consultations compared to other practices, and your choice will be clear. Give us a call for any questions about our prices. How can I pay at FootWise Podiatry Centre?